Standing tall as the independent giant, it would only make sense for Tech N9ne to launch his own official music festival. The Independent’s Day Fest in Helena, MT will be held on July 3-4, and will see Tech N9ne headline with support from Kottonmouth Kings, Murs, Andre Nickatina, Blueprint, and many more. Tech N9ne recently spoke with HipHopNorthwest.com about the music festival, and what fans could expect. During the interview, Tech explains how the festival came to fruition and why it is that certain acts were chosen to perform. An obviously excited Tech implies that this festival will be a history making event, and fans won’t want to miss out! Click here to listen or scroll down below. 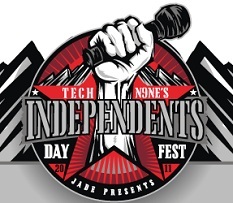 Click here to purchase tickets for Tech N9ne’s Independent’s Day Fest.